Leonard Cohen's deeply personal first LPs came out at a time when many of his peers were issuing furious, counterculture-inspired rants; he clearly had little interest in sticking with the pack at the time. So it makes a certain kind of contrary sense that Cohen would put out an offbeat topical collection two and a half decades later. 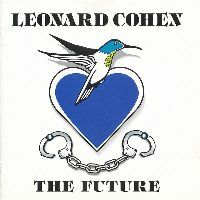 The Future is an odd duck of an album; it's also brave, funny, and fascinating. "Give me back the Berlin Wall / Give me Stalin and St. Paul," Cohen petitions sardonically in the title track, adding, "I've seen the future, brother: it is murder." "Can't run no more with the lawless crowd / While the killers in high places say their prayers out loud," he intones in "Anthem." In "Democracy," he name-checks Tiananmen Square while surveying the United States ("The cradle of the best and of the worst"). Cohen has only improved with age as a vocalist; he sounds like a cross between Mark Knopfler and Barry White. While the polished production takes some getting used to, it's somehow suitable that cooing background vocals and programmed tracks temper these low-boil diatribes. This is, after all, The Future. grundsolides album..nichts was wirklich heraussticht, 2 picke ich trotzdem raus; Anthem und das titelstück verdienen sich das. Textlich ein verdammt starkes Album. Musikalisch nicht immer überragend. Album ist größtenteils textlich und musikalisch überragend, eine absolute Perle der 90er. In der Gesamtbetrachtung gesehen ein durchaus befriedigendes Album. Durchschnitt: 4,44.